It began in the 1950s. Angel-headed hipsters were making some noise in coffee houses and on the page. The Beats made some cracks in the stifling façade of 1950s America, and soon dynamic, independent filmmakers got the vibe. A new type of cinema was born. Shirley Clarke was one such filmmaker who got the vibe and became a leader of the American avant-garde cinema. In 1953 Clarke made her film debut with Dance in the Sun and was nominated for an Academy Award for her short film, Skyscraper, in 1960. In 1961 she produced her first feature, the highly controversial The Connection, which won the critic’s prize at Cannes. The Connection is a hybrid of cinema verité, nouvelle vague sensibilities and the pulse of American bohemia. The film was banned because of its obscenity and the way its frank depiction of drug culture made some critics uncomfortable. It brilliantly captures the be-bop infused counter-culture of the early 1960s with as high a level of verisimilitude as one can get. The Connection depicts the same type of angel-headed hipsters that Kerouac coloured his books with, and is set in a one-room tenement where junkies, musicians, and other dudes await the arrival of the Cowboy. The Cowboy is their “Connection” who will provide them with their heroin fix. All the while, Clarke shows us a documentary filmmaker who wants to capture the hip scene encouraging his subjects to just “act naturally” in front of the camera. Like many other filmmakers and artists of the period, “acting naturally” is the key to Clarke’s work. In letting it all hang out, a new aesthetic seemed to sprout. 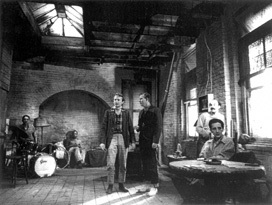 Clarke based The Connection on a Jack Gelber play of the same name, which was performed at the historic Living Theater in New York. Full of jump-cuts, sloppy camera-handling, and improvised dialogue, The Connection serves as a reminder that filmmaking can maintain an intoxicating chaos in spite of the very rigid technical limitations of the medium. The film may be short on plot and character development, but is technically innovative and reminds the viewer of the unlimited potential of cinema. While Clarke was a highly innovative filmmaker on the level of experimental, cinematic virtuosos such as John Cassavettes and influential cinema verité practitioners such as the Maysles Brothers and D. A. Pennebaker, she undeservedly received less notoriety. Clarke shows an adept hand at jazz-like constructions of image and sound and the film’s recreation of a junkie haze is as intense as anything you’re likely to encounter from that era. Clarke was a dancer and choreographer before she delved into cinema, and she has often been quoted as saying that her films were “a choreography of images”. The Connection is often a rambling, chaotic display of debauchery and suffers from over-hip pretensions. However, the wrangling of wild, spontaneous footage into a semi-cohesive form while still maintaining its authenticity and molding a narrative is what Clarke’s film pulls off. Among some of the most memorable characters in the film are the sarcastic Leach, played convincingly by Warren Finnerty, and the super-cool Carl Lee as Cowboy. However, Clarke manages to elicit solid performances from all of the ensemble. The film quietly jangles the nerves as the characters descend into withdrawal. Clarke’s film depicts a generation who seeks drugs and alcohol to assuage feelings of disillusionment. While certainly more objective than most social commentary, The Connection does have a social heartbeat. The dramatic situation it offers can be applied to a larger social context and lends itself to any number of interpretations about the hypocritical society that these characters inhabit. For all its pretensions and sometimes frustrating lack of coherency, The Connection maintains an appeal that has held over the years. It is also a testament to an important pioneer of experimental film. Shirley Clarke’s work should continue to be screened, studied, and discussed, as she remains an iconoclastic artist who is vital to the development of the medium.